In 1842 a refectory, drinking fountain shelter and swings were constructed in Washington Park. In a time of Temperance the structure was erected with the purpose of providing needed refreshment. Intoxicating drinks, cigars and cigarettes were not sold. The shelter was seated on a three tiered octagonal stone plinth. The elaborate wooden structure of the pavilion was Moorish in design. The dome and finial were gilded and bright colours accented the details. The roof was slate laid in parti-colours. The interior contained detailed panelling on the sides, and the piazza ceilings were elaborate. Eight columns with trefoil arches supported the canopy. A three feet high lattice was constructed between four columns on each side of the structure restricting entrance and exit of the shelter. A central suspended gas globe lit the interior. The drinking fountain was placed in the centre of the structure beneath the lamp. Water was dispensed from a deep well supplied by city mains. The font was a single pedestal basin with four decorative columns rising from an octagonal plinth. Four salamanders descended the fountain pedestal as a symbol of courage and bravery. The basin had a scalloped edge and decorative relief. A central urn with four outstretched tendrils offered drinking cups suspended by chains. The terminal was a crane recognized as a symbol of vigilance. This drinking fountain was casting number 7 from Walter Macfarlane’s catalog. It was manufactured at the Saracen Foundry in Glasgow, Scotland. A lack of maintenance caused deterioration, and by the 1960s the drinking fountain pavilion, croquet shelter and swings within the area had crumbled. Rutherglen’s Jubilee Fountain was originally erected at the west end of Main Street (the Gushet) in 1897 to celebrate Queen Victoria’s Diamond Jubilee. Due to the increasing presence of the motor car it was relocated to Overtoun Park in 1911 to accommodate traffic flow. It was registered as a Category B listed building on 4 April 1974. The canopied drinking fountain is design number 20, an elaborate 18 feet by 4 feet fountain, sold by Walter Macfarlane & Co, and manufactured at the Saracen Foundry, Possilpark, Glasgow, Scotland. Seated on an octagonal plinth, the open filigree canopy is supported by eight columns with griffin terminals which are positioned over capitals with foliage frieze above square bases. On each side, arch faceplates provided a flat surface for an inscription using raised metal letters; often the useful monition, Keep the pavement dry. Civic virtues such as temperance were often extolled in inscriptions on drinking fountains. The ribbed dome is open filigree decorated with dove and flower relief. The internal capitals contain flowers, statues of owls on enlarged column heads and lion mascarons on internal shields. The structure is surmounted by an imperial crown finial. Under the canopy stands the font (design number 18.) A circular shaft, ornamented with water lilies, rests on a wide base with canted corners. Four lion jambs support four highly decorated quatrefoil basins. Rising from the centre is a pyramid shaped stanchion decorated with swan and bird decoration. A kylix-shaped lamp terminal with four consoles offer drinking cups suspended by chains. Sitting atop the lamp was a bust of Queen Victoria which was removed in 1992. Cow Square was a former market square, and it is here that we find a cast iron drinking fountain and horse trough painted in silver. It was erected in 1902 to celebrate the coronation of Edward VII. Seated on a rectangular plinth of stone, the structure consists of two horse troughs and a central pedestal with four arched inset panels displaying a mask of a mythical sea creature. The mask on the east facing panel spouted water into a demi basin. Eight fluted pilasters surround the base. Four corner pilasters are the same height as the troughs. The four central pilasters which surround the central pedestal extend into columns with knob finials. The abacus and four winged Greek votive sphinx support a fluted pillar with acanthus leaf decoration. The structure is surmounted with a round glass globe operated by gas. At ground level two small basins were fed by overflow from the troughs and serviced dogs and other small animals. A dedication is engraved across the east facing panels of each animal trough: ERECTED IN COMMEMORATION / OF THE CORONATION OF / KING EDWARD VII / AUGUST 9TH 1902. 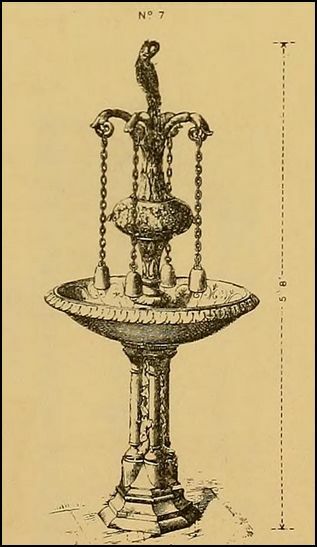 The multi use cast iron drinking fountain, horse trough and lamp was cast by Coalbrookdale Company in Shropshire for T. C. Head, a Somerton ironmonger. It was listed as a category grade II listed building on 30 September 1985. The drinking fountain was commissioned by the Bootle Health Committee to celebrate the royal marriage between the Duke and Duchess of York. It was erected in the grounds of Bootle Hospital in 1894. This cast-iron drinking fountain, with four basins arranged around a tall ornate column, originally stood in the grounds of Bootle hospital. Due to increased traffic in the hospital grounds, it was relocated to Derby Park in 1935. The fountain was restored in 2008. The fountain was manufactured at Walter Macfarlane’s Saracen Foundry, and stands on a two tiered octagonal plinth. Drinking fountain number 19 was originally 10’ 10”which included a statue of Samson. The wide base is in the form of a St. Andrew’s cross, on which is set a circular shaft, ornamented with water lilies. Four lion jambs support four highly decorated quatrefoil basins. The stanchion and central column are decorated with floral relief. A dedication shield records: Erected By Subscription / In / Commemoration Of The / Marriage Of / T.R.M / The Duke And Duchess Of York / On 6th July / 1893. Four tendrils protrude from the column to suspend drinking cups on chains. The terminal was a statue of Samson, which is no longer present. Symbolism was popular in Victorian times. Lions are symbolic of guardianship and Samson is symbolic of strength. A memorial clock and drinking fountain, manufactured by the Lion foundry in Kirkintilloch, was erected in 1934 in honour of Joseph Levi, a local man who founded the Coventry Philanthropic Institution in 1854. The Society supported the working class during periods of unemployment and illness. It was a great success, supplying 5,000 quarts of soup and 540 loaves of bread in the first year, thanks to the members of the Society who made personal donations and organised fund raising to assist the needy. Rising from a two tiered square plinth is a 15’ high pillar with attic base. At the base, rectangular inset panels contain a dedication plaque and two demi basins. As the column narrows four inset panels contain a second dedication plaque and a bust of Joseph Levi. An abacus supports Corinthian columns and inset arches with gables on four sides. The clock tower base is decorated with fish scale inlay. The clock, with faces pointing in all four compass directions, is surmounted by a fish scale dome with an orb and spire finial. The north face contains: a plaque with dedication details, ‘Founder / Of The / Philanthropic Societies / In / Coventry / President / Ald. A.H. Drinkwater J.P.; a portrait bust with the inscription, ‘Joseph Levi’; and the date, ‘Erected / By / Public Subscription / 1934’. The east face contains a demi basin and the inscription, ‘The Coventry Society / Founded 1854 / Chapel Fields Society / Founded 1888 / Farlsdon Society / Founded 1900 / Foleshill Society / Founded 1904’. A small stone step was made available beneath the basin to assist younger persons. The west face contains a demi basin and the inscription, ‘Golden Cross Society / Founded 1859 / Hillfields Society / Founded 1888 / Stoke Society / Founded 1904 / Charterhouse Society / Founded 1925’. The clock’s mechanical movement was replaced with an electric movement which corroded over time and caused it to seize. Although a beloved feature in the park, vandals defaced it with graffiti, and managed to throw a rim and tire onto the clock tower. The neglected structure fell into disrepair, and the council eventually encircled it with a fence as a safety precaution. It was dismantled in 2011 and put into storage to allow the construction of the play area known as Dr. Dave Tick Tock Play Area. The Gosford Park and Stoke Park Residents Associations have petitioned the City Council to restore the clock. A campaign named ‘Time to Bring the Clock Back’ will assist the endeavour by organising fund raising events. A specialist company in Leicester was hired to examine the clock and prepare an estimate. Column Corinthian, a fluted shaft with flowers and leaves at the capital. In 1901 the British residents of Paraná donated a fountain to the city in commemoration of Queen Victoria, and their relationship with the Argentinian people. It was erected on the Boulevard Racedo in front of the railway station. The drinking fountain was number 27 manufactured by Walter Macfarlane & Co. in the Saracen Foundry, Glasgow. The design was well suited for street crossings, squares, market places, etc., as it afforded drinking accommodation for a large number of horses and drivers, and effectively lit a wide space, with the least possible obstruction to other traffic. The structure provided a drinking trough for horses with a small basin for dogs at ground level. The trough was a circular cast iron basin supported on legs in the form of horses’ hooves. The central stanchion supported the structure which was seated on a circular plinth. A central fluted column was capped with a lamp and crown terminal. Roofed in with scales of opal glass the lantern cast the light downwards (design number 223). A shield on the post offered inscription: “The British residents of Entre Rios, the Municipality of Paraná, in commemoration of government of HM Queen Victoria, and in gratitude for the feeling shown by the Argentine people. Paraná, January 22, 1901.” Four projecting tendrils suspended cups allowing humans to drink from the spouting water whilst horses drank from the large basin. The original hexagonal lamp with fish scale design was probably replaced when electricity was introduced. The current lamp differs in shape and does not have a crown terminal. The clock tower drinking fountain in Rotherham, England was commissioned by James Hastings, a local businessman, to commemorate the coronation of George V and Queen Mary. Manufactured at Walter Macfarlane’s Saracen Foundry of Glasgow, the 32 feet tower was installed in 1912 at Effingham Square, Rotherham. The front of the octagonal pedestal offers a large drinking trough for horses supported by legs in the form of hooves and fetlocks. Receptacles for human consumption are supplied in the form of small basins with a trefoil art-form located between the basin and the tap above. Bands of quatrefoil fret are in each of the eight panels surrounding the pedestal. Seated above angled gables are eight commemorative panels, four of which are blank arch faceplates. Four panels are rectangular with a peaked terminal. An inscription on the panel at the front of the structure states, To Commemorate the / Coronation of / King George V / and / Queen Mary, and a panel on the side is inscribed, Presented By / James Hastings / of Rotherham. A two tiered acroter supports an attic base with four slender columns from which decorative pendant lamps are suspended. The column capital supports a four sided clock bound by decorative spandrels. The acroteria is edged with elaborate scroll relief, and at each corner is an acorn finial, a symbol of life and immortality. The structure is surmounted with a decorative openwork corona terminating in a ball finial. A chiming bell cast by John Taylor & Co of Loughborough is suspended in the centre of the corona. The clock mechanism was made by John Mason of High Street, Rotherham. During redevelopment of the area, the tower was relocated from Effingham Square to Walker Place in 1969. It was listed as a grade II historic building in 1986. In 2013 restoration of the Hastings Clock by Calibre MetalWork included cleaning, repair and repainting of the cast iron structure; and clock restoration specialists Smith of Derby refurbished the physical clock and serviced the timing mechanism before it was returned to its original location in Effingham Square.